So you’ve bought yourself a fancy processor or graphics card, but did you, like many before you, forget to buy an essential item? Without thermal paste, your heatsink won’t be able to protect your shiny new hardware to the best of its ability, which at best is an annoyance and at worst leaves you with a very expensive and very broken PC component. We’ve taken the time to scour the market and found the best thermal paste for a variety of situations to help save you time and allow you to get to the fun part – trying out your brand new piece of tech for the first time. We’ll be taking a closer look at each of our top recommendations below. This will involve considering any advantages or disadvantages they may have and judge the situation they’d be best suited for accordingly. With that said, let’s begin with the StarTech.com Thermal Paste. We’re starting this list by with the least expensive thermal paste. Retailing for less than $5, the StarTech.com paste is enough to do the job and provides for 4-6 applications per tube, so even if you make a mess of it, there’s plenty left over to give it another try. It is a metal-based substance which contains metal oxide to provide better heat conductivity, however, this does mean that if you use too much and get it onto a circuit, there will be some problems, so be sure to only use a small dot of it at a time. Despite containing metal, this paste is barely conductive to electricity, which means that it’s safe to use in high performance builds. As it does store a tiny amount of electricity, we would recommend using a less conductive thermal paste for any builds containing very expensive components, however, for most people, this will do just fine. The thermal conductivity of this paste is measured at 1.9 watts per meter Kelvin (W/mK) – this rating shows that the StarTech.com paste is superior to a silicone-based product, but ultimately is quite a low reading. Don’t get us wrong, it will fit the needs of most users, but for peak performance, higher conductivity would have been preferable. This seems reasonable given the extremely low price, though, and so we can’t really complain. The operating temperature range of this paste is -22°F to 356°F, so rest assured, there’s no way you’ll be able to exceed these temperatures unless your PC is an experimental science build and if so, we’re pretty sure you should be using a more high-end thermal paste. This product gives stable performance across a wide range of temperatures, though, which is why it’s perfect for people who value consistency in their computers – it’s an easy way to reduce the number of potential factors in the event of a problem. 1.5g of this paste will likely last longer than the lifespan of your PC, so there’s no need to worry about buying more than one tube. As long as you put the cap back on and store it someplace dark and dry once you’ve finished applying the paste, it’ll be in perfect condition the next time you need it. Additionally, it comes in a resealable syringe which allows for easier, more precise applications than a squeeze tube or jar can provide. All things considered, this paste is pretty decent, given its low price tag. It has a decent amount of heat conductivity, provides enough paste to allow for multiple applications and has a handy, easy to use syringe applicator. At under $5, it’s the perfect thermal paste for when you just need the job done quickly and whilst it won’t hold up against overclocked powerhouse CPUs or GPUs as well as more expensive pastes, it certainly does a reasonable job and as such, is well worth the money. ARCTIC are widely known for creating one of the best thermal pastes available, and with a little reading, it’s easy to see why. This paste is made up of carbon micro-particles which make it vastly more heat conductive than most of its competitors, and a significant improvement upon low-budget pastes like the one provided by StarTech.com. Accordingly, this paste is more expensive, however, it also comes in much larger quantities (small tubes are also available). Retailing at around $20 for 20g, this is considered a high-end, high-performance paste and works best in high-performance computers. This makes it an invaluable product for anyone who likes to push their hardware to the limit through overclocking or modding. Additionally, the large capacity allows for around 30 applications, making it ideal for people who maintain or build multiple computers. ARCTIC claim that each application will last for at least eight years if applied correctly, so in theory, it’s possible to make a single tube last for decades (although at that point, we would recommend just buying a new tube to guarantee you weren’t applying sub-standard paste). This paste does not contain any kind of metal and as such, does not conduct any electricity, making it safe to use on your graphics card without fear of shorting it (although, if you’re careful, there’s no risk of this with a metal-based paste either). A silver or copper based paste can also damage electrical pins if it comes into contact with them, whereas this product is perfectly safe as long as you clean it up immediately. The conductivity of this paste is rated at 8.5W/mK, making it almost eight times more effective at siphoning heat than the StarTech.com paste – this is what the difference between good and great thermal paste looks like. Given this high heat conductivity, this paste will do a great job at drawing heat away from your expensive components and increase overall performance as a result. 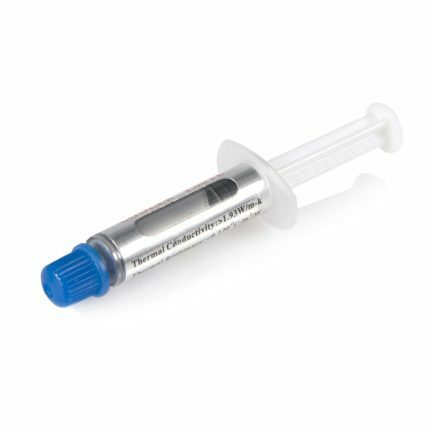 Similar to the StarTech.com paste, this product comes in a syringe – this allows for quicker, more precise and most importantly, less messy application. There’s often a lot of confusion as to how much paste is needed, but in our experience, thermal paste is like Brylcreem – a little dab’ll do ya. Don’t be tempted to go overboard just because it’s a large syringe because this can actually reduce the paste’s efficiency. Similarly, don’t skimp on it, a pea sized amount will do nicely. Overall, we think that this paste would be great for someone who likes to know that they always have the right tool for the job. The ARCTIC MX-4 thermal conductivity is fantastic – it does an incredible job at transferring heat and comes in large enough sizes that it’s unlikely you’ll run out anytime soon so really, what more could you ask? Some people like to buy things in bulk “just in case”. Whilst a single syringe of the ThermalCoolFlux thermal paste is enough for 4-6 applications, there are situations where multiple syringes become necessary: if you work as part of a team in a repair shop, you’ll quickly find that a single syringe gets lost or runs out relatively soon, and that’s when you’ll truly appreciate the value of having some left over. This paste is perfect for people who find themselves frantically looking around for that one specific tool mid-build. Disaster can strike at a crucial moment when you have that PC case open – maybe some dust gets in, maybe you lose your screwdriver in the messy cabling– whatever the situation, it’s a huge relief to know that there’s always a spare tube of thermal paste in the toolbox if you can’t find the one you planned to use. This paste is pretty good at conducting heat – while it doesn’t have the same level of efficiency as the ARCTIC MX-4, it’s less than half the price, selling at under $10. Bearing in mind that this is the price for five 1.5g syringes, each good for at least four applications, it works out at 50¢ per use. The efficiency of this product is rated at 3.2W/mK, so it’s an improvement upon the StarTech.com paste, with more than twice the heat conduction. This paste advertises itself as “silver-coloured”, however, unfortunately, it doesn’t actually mention what it is made of and the manufacturers have been less than forthcoming with details. We can make an educated guess based on the color, consistency and heat conduction of the product though – it seems to be a metal based paste, similar to the Startech, yet more efficient. It has a good consistency, not runny, not too thick, and seems to do the job well enough for most builds. For a top of the line PC, though, you’ll see greater benefits from a paste with a higher heat transfer rating. Ultimately, the biggest advantage of this product is the delivery method. It comes in five separate syringes and does a reasonable job at getting heat away from the CPU or GPU. With 3.2W/mK, you’ll see a large drop in component temperature when using this paste versus using none, likely of 40°F or more. We would have liked to see a few more specifics provided by ThermalCoolFlux, however, the product itself is more than adequate for general use and is very inexpensive, so we can still recommend it wholeheartedly. If you want the best, you have to be prepared to pay a little more. If this sounds like you, then the ARCTIC Silver AS5-12G might just be perfect for your needs. Costing between $10 and $20, this is roughly equivalent to the MX-4 in terms of price once you take into account this product’s smaller size – 12g instead of 20g. The paste is made of 99.9% pure silver, with the rest consisting of ceramic particles for improved heat conductivity. This allows the Silver AS5-12G to achieve the highest heat dispersion rating of any product in this list at a huge 8.9W/mK – this is really what you should be using if you have any performance-focussed builds or want to squeeze those all-important extra clock cycles out of your CPU. As ever, if you’re overclocking your hardware, we’d recommend investing in a decent cooling system as well, since paste can only do so much on its own. ARCTIC claim that this paste is “formulated to conduct heat, not electricity”, however, whilst it doesn’t conduct electricity, it is ever so slightly capacitive (it stores a tiny amount of charge) and as such, can cause problems or damage if it connects two electrical paths. If you’re careful to keep it away from pins or leads and only use the recommended amount of paste, though, you’ll be just fine. This paste is Restriction of Hazardous Substances (RoHS) compliant, meaning that there are no hazardous substances included – a claim that a lot of low-budget thermal pastes can’t make. Whilst we’d still recommend avoiding contact with your skin, it shouldn’t do you any harm and can be safely used without worrying about your health. This leaves your attention free to allow for greater concentration on the task at hand. 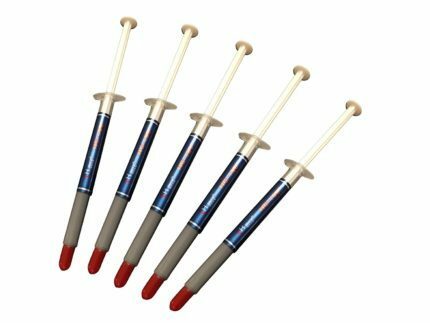 The AS5-12G paste has three distinct phases: as it’s released from the syringe, it thins out to minimize the size of any microscopic gaps and improve contact between the heatsink and your hardware. Over the next 50-200 hours, it thickens out and improves its seal, before finally hardening and becoming stable for the foreseeable future. Again, it can survive temperatures which would destroy every other component in your PC (-58°F to 266°F), so there’s no need to worry about that as long as your other hardware has enough cooling. One thing is clear: when you take the exceptional heat transferral rate and a large amount of paste provided, the ARCTIC AS5-12G becomes very attractive. The price is higher than its competitors, but still low enough to be considered reasonable but care must be taken to avoid creating a bridge between nearby electrical channels since the paste is slightly capacitive and could cause damage. 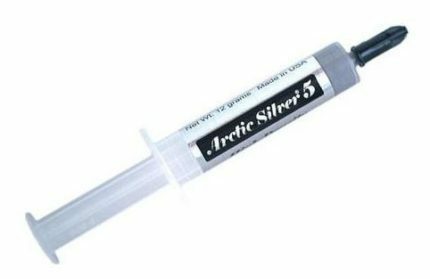 The important thing to remember is that this thermal paste gets the job done, and done well, which is all you can really ask – for the highest possible performance, ARCTIC is a great choice. With such a simple product, you might think that there isn’t much difference between two pastes, but you’d be wrong. However, some manufacturers will try to get you to buy their product based on irrelevant information like the color of the paste or the fancy packaging, so we’ve put together a short guide as to which aspects are most important to consider in order to find the best thermal paste for your needs. First things first: how much paste do you need? If you just need it for a single application, there isn’t much point in buying a large amount, a small 1.5g tube will be more than enough. However, if you need to use it for multiple machines, then a large tube would make more sense economically. Next, consider the delivery method. Does it come in a tube, tub or syringe? Tubes of paste are usually less expensive, but aren’t very precise and can produce much more paste than you need if you aren’t careful. They also tend to be difficult to use when they’re nearing empty – imagine a toothpaste tube. Tubs are usually only found when buying very large quantities and allow for tool-based applications, and syringes offer maximum precision at a reasonable cost. Most of the time, we’d recommend a syringe, because the price difference is minimal and you can more accurately control the amount of paste applied. Heat transferal is measured in Watts per meter Kelvin. Simply put, higher values are better and will draw more heat away from your CPU/GPU. These pastes are usually only a couple of dollars more expensive, so it’s usually a safe choice to buy the product with the highest rating. What is the paste made of? Metal-based substances conduct heat very well, but also tend to conduct a tiny amount of electricity, which can cause problems if it comes into contact with something other than the heatsink. They can also be capacitive, meaning they store a small amount of charge, which leads to the same kind of problems. The trick is to take your time and make sure you don’t use too much paste – if you follow our guidelines, you won’t run into any trouble. Each tube is good for multiple applications – expect to use about 0.3g of paste each time. Once you’re finished, just wipe the tip of the tube with a paper towel, screw the cap on and put it somewhere safe. Thermal paste is pretty resilient, so as long as you don’t freeze it or leave it in the sun, it’ll be good to go for years to come. Another important point – thermal paste hardens up with use. This is normal! It’s not like cleaning a fan, which should be done every month or so – you only need to reapply thermal paste every few years, if that. Keep an eye on your hardware temperatures and if you notice an upwards trend in the short term, maybe consider improving your cooling system rather than re-applying thermal paste. Also, some newer hardware comes with thermal paste already applied, so before using any additional paste, check the documentation that comes with your CPU or GPU and make sure that you actually need to – often, you’ll just be able to insert it as is. 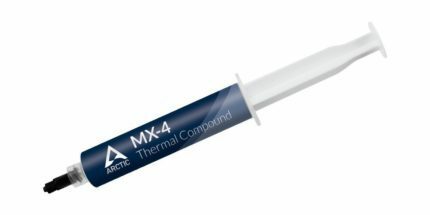 All of the thermal pastes we’ve covered above are great in their own way, however, there is one in particular which we consider more versatile than the rest: the ARCTIC MX-4 Thermal Compound Paste. It provides higher than average transferral of heat, is non-conductive, non-capacitive and comes from a well-known, trusted brand. We hope that this article has been helpful to you, and if so, we’d like to ask you to remember us the next time you need advice on a product. Thanks for taking the time to read this and have a great day.